Nicely tumbled and polished with a lusterous sheen, these Ametrine buzz with positive energy. Ametrine is a naturally occuring mix of Amethyst and Citrine and brings about a connection between the awareness derived from Amethyst and the dynamic energy of Citrine. Medium: 1" and Small: 3/8" to 1/2"
Ametrine has a Trigonal crystal system and is in the mineral class of Oxide in the Quartz group. It is a unique crystal that unites the Amethyst and Citrine color zones clearly defined and separated within the crystal. Ametrine is formed hydrothermally from silicic acid solutions that contain iron. To my knowledge, the world's only source of this bicolored natural quartz is the Anahi Mine located in the jungles of Bolivia. Orinally they were secretly smuggled across the border to Brazil and sold as Brazilian products. In 1989 the rghts to the mine were sold, the Bolivian government changed, and since then these collectible gems became available on the domestic marketplace. 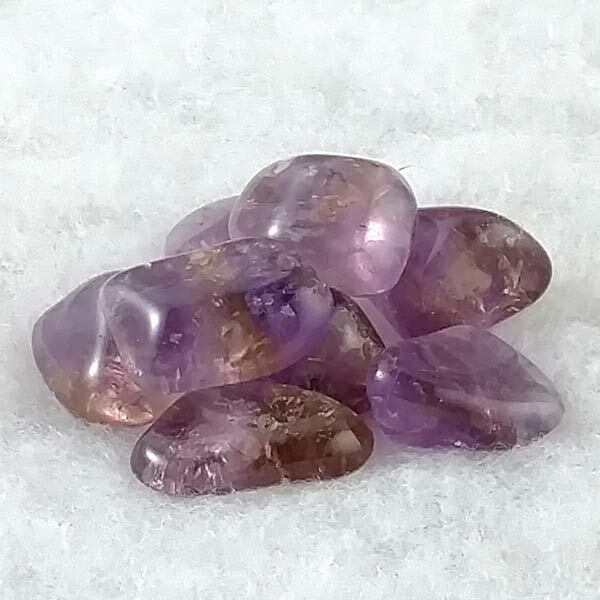 Ametrine is best used when worn or placed directly on the body for long periods of time. When used during meditation the mind is strengthened by laying a crystal on the Solar Plexus and Crown Chakras to fortify our spiritual, mental and physical planes. Ametrine brings about a connection between the awareness derived from Amethyst and the dynamic energy of Citrine. In this way it provides a crystal of well thought, sure action. It can assist in connecting contradictions and brings an intuitive means of success on all levels. Ametrine will encourage optimism and provide joy of life. It provides harmony and a feeling of well being that will not decline even when there is great stress from outside ourselves. Ametrine helps to harmonize perception and concious action. It can stimulate the extraordinary creativity that goes along with great energy. It will improve control over our own lives. 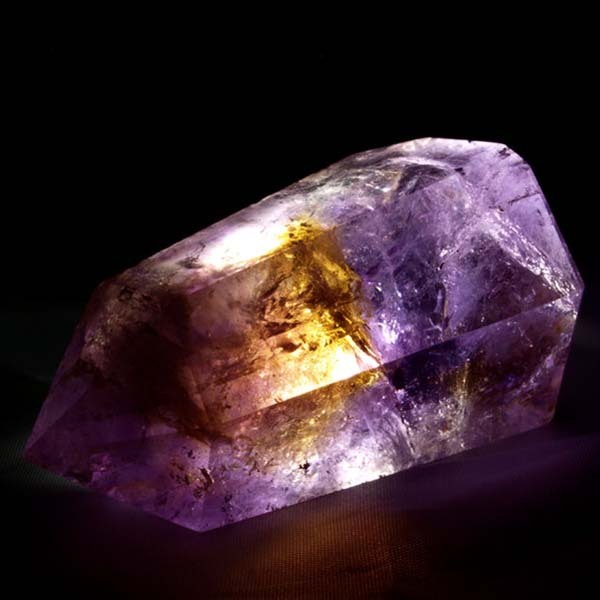 Ametrine has a powerful cleansing effect on metabolism and tissue. It also can enhance the autonomic nervous system and harmonize the interplay between our inner organs. Ametrine has a special affinity with Libra but is beneficial to all signs. Since Ametrine is a combination of Amethyst and Citrine it has the planetary associations of both crystals. Relatively new to the metaphysical and healing disciplines, and because it is only found in one place in the world, I have not found that there is any reliable folklore to relate with this one.